The Mankato ReStore offers a free donation pickup service of large items to be donated. The free service is offered on Wednesdays and Fridays, within about a 15-mile radius of the ReStore (or farther for items of greater value). Please note the item limitations listed on this page. Call us at 507-388-6682 to schedule a free donation pickup or complete the form below and we'll contact you. Thank you for your interest in donating. Generally, we start by asking the following questions: Is the item in good working order? Do you have all the pieces? Would you want to put it in your own home, cabin, or shed? If so, please contact us for our free donation pickup service! Note: The Mankato ReStore reserves the right to decline items not suitable for sale. Donated items scheduled for free pickup service must be on the main floor of the home, in a garage, on driveway or at curbside, ready to load, when the truck arrives. Please note the limitations listed below for free pick up of large items. All appliances must be in 100% working order, clean and less than 10 years old to be suitable for pickup. Full kitchen cabinet sets are preferred. Cabinets must be complete; no individual cabinet components (e.g. cabinet doors). We do not accept commercial doors, mirrored closet doors, or used shower doors. All furniture must be free of stains, rips, pet fur/hair, odors or significant blemishes. Furniture must be structurally sound -- not in need of repair. Denailed quality lumber and siding must be in 6-foot lengths or more; sheet goods, 1/2 sheet or more. No lumber with fasteners or rot or used vinyl siding. No painted lumber. Computers, clothing, televisions / electronics, cribs, mattresses, household items (e.g. 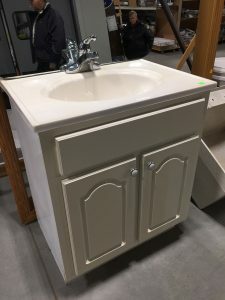 dishes), commercial desks, old wood entertainment centers, fireplace inserts, oil-based paints, chemical solvents, storm windows, used shower doors. All items for pickup must be on the main floor of the home, in a garage, on driveway or curbside, ready to load, when the truck arrives.